We had a great week mountain biking with Fabian and Caroline. 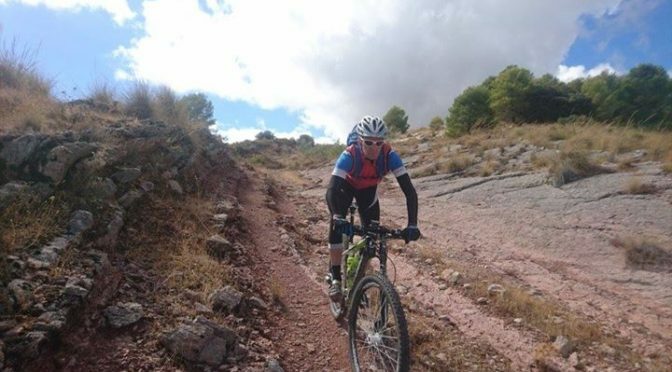 It gave us the chance to ride some of our more challenging routes aswell as a couple of our regular favourites. Recent fire damage above Benasau, it looks bad but some trees need the fire to germinate seeds, and new flowers will soon emerge from the ashes. www.abdet.com/trail-running-spain – our two spring trail running weeks are booking up quickly. Feb 18th and March 18th are the dates. We did the Guara National Park self guided village to village trip. It was wonderful. Hike Pyrenees has designed an excellent hiking vacation in a beautiful setting. The hotels were great and the Hike Pyrenees associates were extraordinary. The people are knowledgeable and helpful – giving great detailed directions and advice. Each hotel was unique and each provided really fine morning and evening meals – plus a lunch for the hike. If you plan a lay over day I suggest Rodellar where you can watch world class rock climbers in the canyon and the rooms are more like small apartments rather than hotel rooms.